This image, also from Point Lobos, presented many of the same challenges as Sunset from another planet. The sun was just starting to come out of the clouds and was really bright. The foreground was reasonably well lit but the rock across the inlet was in shadow. I had to make the conscious choice to give up the detail in those rocks in an effort to capture the texture in the foreground. Just like in the other image, I also had to use 6 stops of graduated neutral density filter to hold the detail in the sky. The combination resulted in an exposure just long enough to turn the sea into a foamy froth, but short enough to retain the wispy texture. As much fun as Sunset from another planet was to make, this is a much more realist scene. Details. This was shot using a Canon 17-40mm f/4L @ 17mm on my Canon 5D. The exposure was 1 full second, at ISO 100 and f/13 aperture. As always, I was using a tripod for this shot. 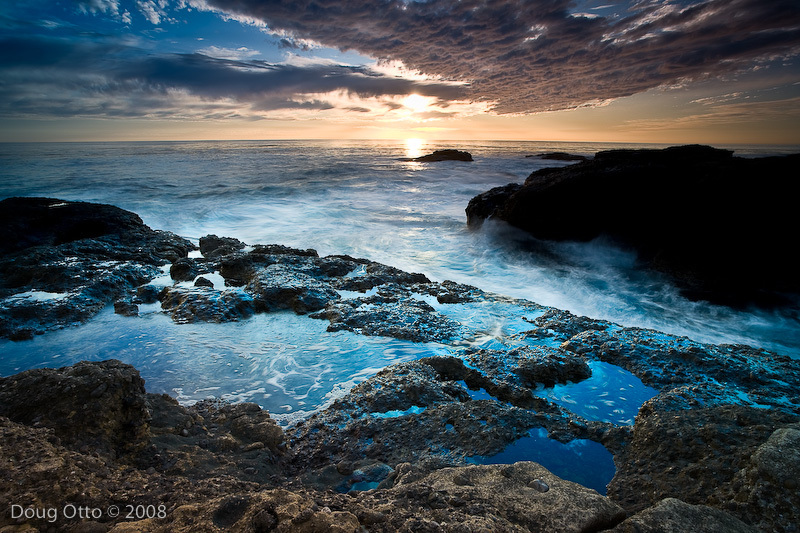 This entry was posted in Photography, Travel and tagged gold-n-blue, Monterey, pacific ocean, point lobos, sunset. Bookmark the permalink.